Nestled along the shores of the Gulf of Mexico is a magical place where the warm turquoise waters lap against sugar-white beaches, where the salt spray and sea breeze is exhilarating, where the hospitality is as warm as the sun. Welcome to Gulf Shores and Orange Beach, Alabama, two seaside towns that are among the fastest growing vacation destinations in the country. If you are planning a vacation to this little stretch of heaven, here are a few tips to help make your visit memorable and stress-free. The cities of Gulf Shores and Orange Beach aren't humdrum beach communities. They're alive and vibrant with a good mix of the young and old bringing excitement to the area. You'll find attractions, dining experiences, music venues, and adventure. Several national festivals have made the Alabama Gulf Coast their home including the Hangout Music Festival and the National Shrimp Festival. Both draw thousands of people to Lower Alabama each year. The Orange Beach Arts Festival attracts artists and musicians from all over the country each March. There is much more to this destination than its 32 miles of white beaches, so much so that a single weekend won't be enough time to take it all in. But here are a few good starting places: Take a ride on the wild side on a dolphin cruise to see dolphins playing in the waves or alligators in the backwaters. For a more intimate encounter with alligators and wildlife from around the world spend some time at Alligator Alley or the Alabama Gulf Coast Zoo. For the kids (and the kid in all of us), check out the thrills at Waterville USA, which is both a waterpark and amusement park boasting 17 waterslides, wave pools, lazy river tubing, go-carts, the Cannonball Run Roller Coaster, miniature golf, and more. And when you get hungry, try one of the many great local restaurants in the area that serve up the freshest Gulf seafood around. It's dinner and a show—the beautiful sunset—as you dine outdoors at Tacky Jacks; enjoy live music, delicious food, and a few drinks with your friends at the Pink Pony Pub; or savor delectable seafood while sipping on a beach-goer favorite, the bushwacker, at the world-famous Flora-Bama Lounge. There are even pet-friendly restaurants in the area, so bring along the family dog. The Alabama Gulf Coast has 32 miles of pristine white beaches. There are 10 public-access beaches along the shoreline, most of which have picnic facilities and many have restrooms and showers. Your best bet is to start with the main public beach located at the end of Highway 59. There's volleyball, picnic pavilions, restrooms, showers, beach bars such as The Hangout, and nearby shopping. There is a small parking fee charged at the Main, West 2nd Street, West 6th Street, and Little Lagoon beaches. The best way to get to the beach is to consider bringing (or renting) a bike and just pedaling your way to the shore. Gulf Shores and Orange Beach have adventure both on land and water. With countless waterways to explore, Gulf Shores and Orange Beach are amazing places to paddle either by kayak or stand-up paddleboard (SUP), where you can glide through the water alongside bottlenose dolphins. Look up and you'll be seeing birds like osprey, eagles, and great blue herons soaring overhead. And for some high-speed action, rent a Jet Ski and speed around the Gulf. Take a hike on the trails of the Bon Secour National Wildlife Refuge through maritime wetlands and forests, over sand dunes, and to the nesting ground of loggerhead sea turtles on one of the most secluded beaches along the Alabama Gulf Coast. Or explore the 10 miles of hiking and biking trails at the Graham Creek Nature Preserve. Speaking of biking, there are plenty of places to pedal. The above-mentioned Graham Creek Nature Preserve has some nice off-road dirt paths that can be muddy and challenging in places while the paved multi-use trails of the Hugh S. Branyon Backcountry Trail and the Fort Morgan Road Trail are just right for cyclists of all ages. The Backcountry Trail is a good place to spot wildlife, visit a butterfly garden, and let the kids try their hand at some bouldering. For a real adrenalin rush try soaring over the blue water via parasail, then wrap up your day with a beautiful fiery orange sunset helicopter ride with Orange Beach Helicopters. If you're staying in Gulf Shores proper, then bring the bike or rent one at one of the many rental shops. Everything you need is close by and traveling by bike is a fun way to get around. 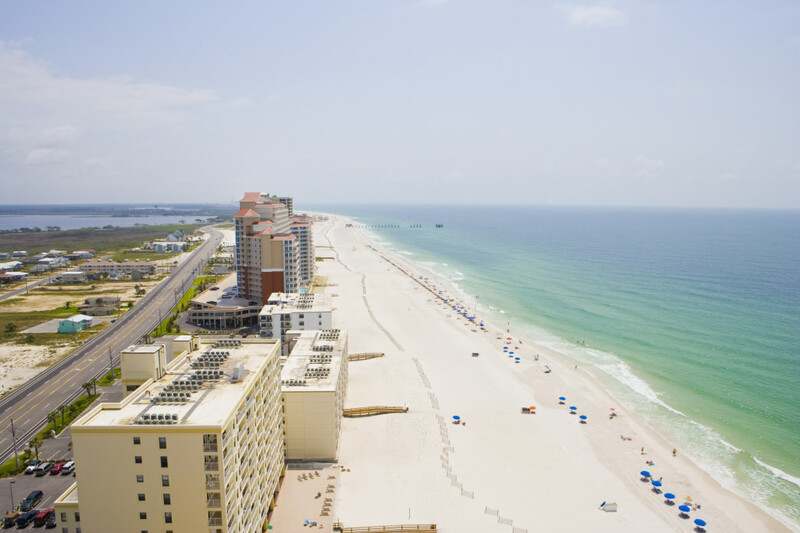 There's no doubt that Gulf Shores and Orange Beach is growing rapidly in popularity. There are two main roads into the towns— Alabama Highway 59 and the Baldwin/Foley Beach Expressway. The expressway has a toll bridge as you cross the Intracoastal Waterway, and it is usually a bit faster. Plus it has recently been extended all the way to I-10. Access it at Exit 49. No need to pack that kayak, SUP, bike, or surfboard. There are ample places to rent those—and more—throughout the area. You can rent bicycles at places like Infinity Bicycles, which also rents “trek trailers” for the little ones to ride in. Beach Bike Rentals offers pick-up and delivery service. Gulf Shores and Orange Beach have several kayak and SUP rental shops including Paddled-By-You, Perdido Paddle Board Company, and Ike's Beach Service. Boogie boards can also be rented at Gulf Shores Rentals and surfboards at Blonde John's. Some of our fondest memories come from spending time on the beach with our friends and family. There are some basic rules you should know before heading out to the beach. The cities have a very helpful website that will tell you all you need to know. Originally written by RootsRated for Gulf Shores AL.